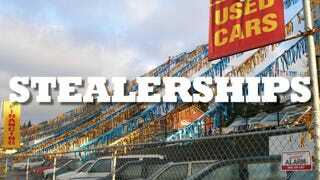 The Federal Trade Commission has been cracking down on dealerships using deceptive advertising. In "Operation Steer Clear" the Commission successfully charged 9 dealers for running deceptive ads, and is processing a case against a 10th dealership. "Buying or leasing a car is a big deal, and car ads are an important source of information for serious shoppers," said Jessica Rich, director of the FTC's Bureau of Consumer Protection. "Dealers' ads need to spell out costs and other important terms customers can count on. If they don't, dealers can count on the FTC to take action." Casino Auto Sales of La Puente, Calif., and Rainbow Auto Sales, of South Gate, Calif., allegedly violated the FTC Act by deceptively advertising that consumers could purchase vehicles at specific low prices when, in fact, the price was $5,000 higher. Both dealers' ads involved a mix of English and Spanish. Honda of Hollywood, Los Angeles, and Norm Reeves Honda of Cerritos, Calif., violated the FTC Act by deceptively advertising that consumers could pay $0 up-front to lease a vehicle when, in fact, the advertised amounts excluded substantial fees and other amounts. The ads also allegedly violated the Consumer Leasing Act (CLA) and Regulation M, by failing to disclose certain lease related terms. Norm Reeves Honda's ads also allegedly violated the Truth in Lending Act (TILA) and Regulation Z, by failing to disclose certain credit related terms. Nissan of South Atlanta of Morrow, Ga., allegedly violated the FTC Act by deceptively advertising that consumers could finance a vehicle purchase with low monthly payments when, in fact, the payments were temporary "teasers" after which consumers would owe a different amount. The ads also allegedly violated TILA and Regulation Z, by failing to disclose certain credit related terms. Infiniti of Clarendon Hills of Clarendon Hills, Ill., allegedly violated the FTC Act by deceptively advertising that consumers could pay $0 up-front to lease a vehicle when, in fact, the advertised amounts excluded substantial fees and other amounts. The ads also allegedly violated the CLA and Regulation M, by failing to disclose certain lease related terms. Paramount Kia of Hickory, N.C., allegedly violated the FTC Act by deceptively advertising that consumers could finance a purchase with low monthly payments when, in fact, the payments were temporary "teasers" after which the consumer would owe a much higher amount, by several hundred dollars. The ads also allegedly violated the TILA and Regulation Z, by failing to clearly and conspicuously disclose certain credit related terms. Fowlerville Ford of Fowlerville, Mich., allegedly violated the FTC Act by sending mailers that deceptively claimed consumers had won a sweepstakes prize, when, in fact, they had not. Some of their ads also allegedly violated TILA and Regulation Z, by failing to disclose certain credit related terms. Southwest Kia companies, including New World Auto Imports, Dallas, Texas, New World Auto Imports of Rockwall, Rockwall, Texas, and Hampton Two Auto Corporations, Mesquite, Texas, allegedly violated the FTC Act by deceptively advertising that consumers could purchase a vehicle for specific low monthly payments when, in fact, consumers would owe a final balloon payment of over $10,000. The companies also allegedly deceptively advertised that consumers could drive home a vehicle for specific low up-front amounts and low monthly payments when, in fact, the deal was a lease and they would owe substantially more up-front. The ads also allegedly violated the CLA and Regulation M, by failing to disclose certain lease related terms, and the TILA and Regulation Z, by failing to disclose certain credit related terms. The regulations on print and television have been pretty clear, but as more dealerships use YouTube and other online media for advertisements. That "fine print" can get glossed over easily. Now the FTC has expanded their reach to investigate deceptive ads in digital formats as well. As car-buyers become more savvy, some dealerships are adapting, but others are finding new tactics to pull the same old "stealership" tricks. Not long ago I found some local ads that are still legal, but are clearly working the system to deceive potential customers. My recommendation is to try and steer clear of any dealership that engages in this type of advertising practice. It is a sign of their operational strategy and what you can expect when it comes down to negotiating a fair price.